Kissimmee City Hall is located at 101 North Church Street, Kissimmee, FL 34741; phone: 407-847-2821. Photo: Colonial Estate, ca. 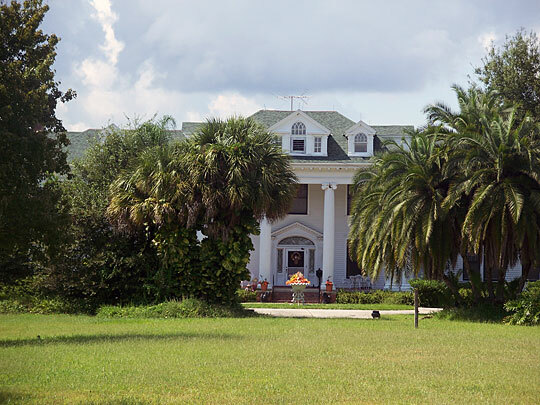 1916, also known as the Tucker/Ivey House; 2450 Old Dixie Highway, Kissimmee, FL. House was designed by architect Henry Green for Georgia lumber baron, J. Wade Ticker. Listed on the National Register of Historic Places in 1994. Photographed by User:Ebyabe (own work), 2009, [cc-by-3.0 (creativecommons.org/licenses/by/3.0)], via Wikimedia Commons, accessed November, 2012. There had been little permanent white settlement on the north shore of Lake Tohopekaliga before to the founding of Kissimmee in 1881. The event that sparked the founding and early development of Kissimmee was the Disston Land Purchase. In 1881, Philadelphia industrialist and entrepreneur Hamilton Disston purchased four million acres of "useless and submerged" land from the state of Florida for $1,000,000. The Disston Purchase included an area of Central Florida that extended on the Gulf of Mexico from Tarpon Springs south to Fort Myers and west to Lake Tohopekaliga. Disston was also granted the right to drain lands in the southern interior of the peninsula, for which he would receive half of the reclaimed land without additional charge. Disston divided his Florida land sales operation into the Florida Land and Improvement Company and the Kissimmee Land Company. The headquarters for the Disston operations were located in Tarpon Springs, but "Kissimmee City," as it was originally called, soon became the center for the drainage operations that ultimately absorbed most of the company's resources. The Disston Company established offices at Kissimmee in 1881 and dredging activity began in January 1882. A post office was opened in May of the same year. Laborers came from many parts of the country to operate dredging equipment and to construct boats and a variety of buildings. By late 1884, canals had been dug to link several of the larger lakes in the chain of waterways found in the areas. Other improvements included the deepening and straightening of the Kissimmee River and opening the Caloosahatchee River between the Gulf of Mexico and Lake Okeechobee. These projects gave steamboats direct access to Kissimmee from the Gulf, opening the area to rapid development. Between 1881 and 1895 Kissimmee blossomed from virtual wilderness into a town of nearly 2,000. Development of the settlement was also fostered by the arrival of the South Florida Railroad in March 1882. Kissimmee became an important freight shipping center that supported citrus groves, cattle ranches, and sugar cane plantations. To adequately manage the volume of shipments from Kissimmee, the railroad maintained three sets of tracks and constructed a railway station near Ruby Avenue in 1889. Two smaller railroads also operated out of Kissimmee during the 1880s. One was the St. Cloud & Sugar Belt Railway which laid track between Kissimmee and the nearby town of Narcoossee in 1888. The other was the Florida Midland Railroad which connected Kissimmee with the town of Longwood. The two short lines, however, found it difficult to compete with the South Florida Railroad and both were ultimately absorbed by the larger company. The South Florida Railroad was itself made part of the Atlantic Coast Line Railroad in 1902. The Town of Kissimmee was formally incorporated in 1883 and when Osceola County was created from portions of Orange and Brevard counties in 1887, Kissimmee was chosen as the county seat. A brick courthouse was constructed on South Vernon Street in 1890. A small commercial district emerged along Broadway Avenue between Dakin and Darlington Avenues in the last decade of the nineteenth century. Another commercial area developed along Emmett street near the courthouse. Scattered residential buildings dotted the landscape. By 1893 there were three railroad stations in Kissimmee and a number of warehouses stood near the railroad tracks. The town had no formal plan to govern development, so that subdivisions grew up haphazardly. At the heart of town was the South Florida Railroad Company Subdivision which was platted in 1884 and revised several times. The area around the courthouse was Patrick's Addition (1882) which extended south to the railroad near which many of the settlement's early residential buildings were found. Numerous small subdivisions were added to the community before the end of the century. The development of Kissimmee began to slow down by the mid 1890s, due in part to financial reverses suffered by the Disston Company. State officials were dissatisfied with the results of Disston's reclamation projects and refused to award him ownership of the additional lands he claimed. The nationwide Panic of 1893 and the Great Freeze of 1894-1895 that destroyed much of Florida's citrus production also dealt Disston a financial blow from which he was unable to recover. Unable to make the government honor his claims to additional state lands, and his finances in shambles, Disston committed suicide in 1896. Disston's Florida land fortune, valued at 2.2 million dollars in 1894, was sold at auction in 1901 for a mere $70,000. The failure of the Disston reclamation projects and the Great Freeze of 1894-1895 proved to be a turning point for the residents of Kissimmee. By the end of 1896, Kissimmee had lost more than a quarter of the population it had enjoyed on the eve of the twin disasters and it continued to decline until the end of the century. Despite the setbacks Kissimmee had suffered, the situation began to improve with the beginning of the new century. The next two decades were marked by a significant expansion of cattle ranching industry and a rebirth of the citrus industry, both of which brought about significant improvements to the city's economy. The continuing roles played by rail and river transportation facilities helped the community weather the difficult economic period it had just experienced. Agricultural products could be shipped directly to major markets, and the community was easily accessible to tourists and settlers. The excellent transportation facilities led to the development of a thriving tourist trade that did much to aid the revitalization of Kissimmee. During the first two decades of the twentieth century the population of the city more than doubled, increasing from 1,132 in 1900 to about 2,722 full-time residents and an additional 1,000 winter vacationers by 1920. Cattle ranching, the oldest industry in the Kissimmee area began to expand throughout Central and South Florida after 1900. Reclamation projects initiated during the Disston era opened thousands of acres of range land and attracted a large number of cattlemen to the Kissimmee area. Further dredging during the period from 1900-1916 greatly increased the amount of range land available to cattle ranchers in the southern half of the peninsula. By 1905, Kissimmee had become the "cow capital" of Central Florida, with Osceola County leading the state in beef production by transporting over 50,000 head of beef annually. The recovery of the citrus industry also bolstered the economy. The citrus groves that had been destroyed by disastrous freezes of the 1890s had been largely replanted, and by 1905 the new trees had begun to fully bear fruit. In 1910 groves in the Kissimmee area produced approximately 100,000 boxes of oranges. Large citrus packing houses once stood along the railroad tracks near Ruby Avenue. Unfortunately, these and other buildings in Kissimmee associated with the citrus industry have been demolished. Improved economic conditions allowed the town to make a number of civic improvements that transformed the appearance of the community from that of a frontier cow town to a modern twentieth century municipality. The city began paving all of its major streets with brick in 1911. Some of that paving is still visible in the historic area of the city. The nationwide "City Beautiful" movement had its effect on Kissimmee as well, evident today in the landscaped oblong medians in the center of Broadway Avenue. The divided boulevard ran from the intersection of Stewart Avenue north to Main Street and featured a bandstand at the intersection of Monument Avenue and electric lighting along its length. The bandstand and original lighting fixtures have since been removed, but the green spaces that divide Broadway Avenue remain intact and are significant elements of the downtown area's historic appearance. The city funded a number of projects designed to provide the residents of Kissimmee with modern amenities. A municipal electric power plant was completed by 1909, and a two-story masonry high school that stood where city hall is located today opened in 1910. By 1914 the city could boast of having a municipal waterworks and the beginnings of an extensive sewerage system. Local lumber mills and brick factories provided the materials for the construction of both commercial and residential buildings. At least one company produced artificial stone and cast concrete block that is still evident on buildings in Kissimmee that date from that period. New construction in the commercial district led the city government to pass ordinances. Requiring the use of fireproof building materials in the commercial area led to the replacement of wood frame structures with masonry buildings. Residential construction kept pace with the expanding commercial area. In 1911, the Kissimmee Valley Gazette announced that a building boom was well under way, and that real estate assessments had risen over $700,000 since 1909. The newspaper reported that more than 150 buildings had been constructed in the city in 1910 and over fifty houses were under construction. Subdivision activity amounted to seventeen plats between 1909 and 1915, most of which pertained to residential areas. Local lumber mills were hard pressed to provide enough lumber to meet the needs of the building boom. After 1916, construction slowed markedly as Kissimmee residents, like the rest of the nation, turned their energies toward winning the war in Europe. Subdivision platting fell flat and few buildings, residential or commercial, were erected. Although military bases were established in Florida during the war, there was little military related activity in Kissimmee. The period between 1900 and 1916 brought significant expansion to the commercial and residential sections of the town, and the city had undertaken many improvements in the municipal infrastructure. The last few years of the decade proved be merely a short pause in the continued growth and improvement of Kissimmee which was to resume in the 1920s. W. Carl Shiver, Florida Bureau of Historic Preservation, Historic and Architectural Resources of Kissimmee, Florida, nomination document, 1993, National Park Service, National Register of Historic Places, Washington, D.C.